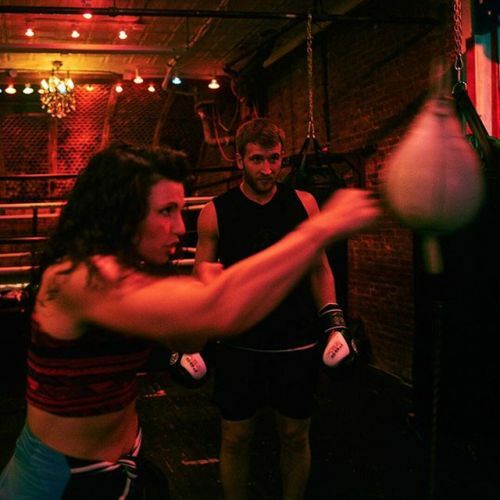 “The trainer Alicia Napoleon, a pro fighter known as “the Empress,” shows Kyle Van Fleet how to work the speed bag at @overthrownewyork. The gym’s 30-year-old founder, Joey Goodwin, says his business aims to find “the middle ground between @barrysbootcamp and @soulcycle and #CBGB.” @overthrownewyork is one of two Manhattan gyms that opened in May catering to those interested in a boxing-related workout. But most of their customers have no interest in taking a jab to the face. They’re just there for the workout. Photo by @bondukestudio for @nytimesfashion. #regram” By nytimes on Instagram.